2 year warranty on labor. Decks outside the 2 year warranty will be fixed for a nominal charge. Splits, cracks, and knots in wood are not considered as warranty issues. Treated wood will warp, split, shrink, crack, knots will fall out. There are a lot better choices for decking and railing. Manufactures warranty are just that, manufacturers warranty. To expedite warranty issues please provide the following: pictures of the affected area and a copy of the contract. Pictures quickly resolve many issues and a copy of the contact will gives us the date, and material used. Should you require replacement of materials the length of the boards will be needed. We wish to avoid running back and forth and getting nothing done, your cooperation is greatly appreciated. If (for whatever reason) you will require us to measure boards at your house a $200.00 fee will be required. Paid in advance. No exceptions. You the homeowner are more aware of “areas of interest” than we will be. Use of the internet to subvert Killer Decks warranty policies will be handled legally if necessary and will void any warranty claims. Send your info to: sales@thedeckbarn.com you will be contacted in 3 days via e-mail or phone, e-mail works best. Cosmetic issues will be scheduled when we are in your area. Structural problems will be handled right away. I note that your team was at our house this week, in response to my letter to you. I appreciate that you promptly addressed the issue I raised. I have found that others in the home improvement business are not nearly as responsive as yourself. Thank you very much for your commitment to customer satisfaction. So far so good, the deck is indeed beautiful. Thanks for correcting the problems in a fast, professional, and timely manner. Your carpenters were great, polite and very professional. I will be recommending to everyone I encounter, Scholl Carpentry aka Killer Decks. I see why you have been in business for 20+ years. Keep up the good work. Your guys merit a pat on the back, not to mention a bonus. I should hope the deck stands up as good and long as your reputation. 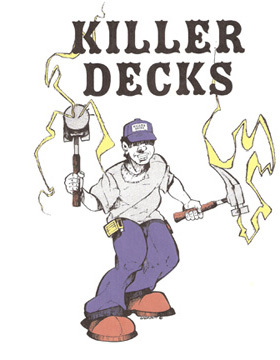 © 2011 Killer Decks. All rights reserved.